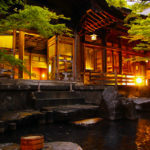 Of the nine hot springs that make up the Yamanouchi district, Yudanaka and Shibu Onsen are the best known. Bathing in the nine traditional wooden baths in Shibu Onsen is said to ward away evil and bring good health and longevity. The area owes its geothermic activity (and much of its tourism) to the nearby volcanic Shiga Kogen, renowned for its superb skiing. Yudanaka itself has seen more development than Shibu Onsen over the years and has a slightly more modern atmosphere although this becomes more traditional walking up from Yudanaka train station at the bottom of the gently sloping town. 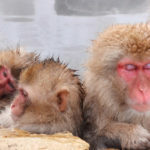 Nowadays, Yudanaka is most famous for the Snow Monkeys in nearby Jigokudani Monkey Park.